Being a truck driver brings with it the stigma of being an extremely unhealthy profession because the majority of the time, drivers are sedentary and frequently eat fast food. It’s true that long hours behind the wheel can lead to a whole host of physical and mental issues but it doesn’t have to be that way. There are steps drivers can take to improve their health and counteract the negative effects the profession may bring. Fast food is notoriously high in fat, calories, and sodium and when mixed with lack of exercise, it is a recipe for heart disease and obesity. When you get your certification, the DOT tests your blood pressure and if it’s over the limit, you may only receive a certification for a year or if it’s too high you may not be certified at all. Sitting in a truck cab for hours on end can cause painful injuries to your spine. Back injuries can also occur during the loading and unloading of freight. Just because you’re inside your truck, doesn’t mean you can’t get sunburned. Prolonged sun exposure can also result in skin cancer. Constant exposure to diesel fumes can cause lung and breathing problems. Smoking is high among truckers which, as everyone knows, causes lung cancer and COPD. Being a truck driver is one of the most dangerous professions, mainly due to highway accidents with driver fatigue as one of the leading causes of most accidents. Sleep apnea happens when you stop breathing for short periods during sleep. It can be caused by obesity but also occurs when fluid collects in the legs while sitting for long hours and moves to the neck at night. Interrupted sleep at night can make you tired during the day which can cause dangerous driver fatigue. Sitting for long periods of time can cause blood clots that can travel to the brain and cause a stroke. Some truck drivers use drugs like amphetamines and cocaine to stay awake during long hours on the road. Long hours alone in the cab of a truck can be lonely and cause depression. However, depression isn’t always caused by loneliness and it may be due to a medical issue. While the list of health problems that occur most often for truck drivers is long, the good news is they can be turned around with a little work. It may be difficult to do because you’ve got deadlines, but try to fit in at least a half hour of aerobic exercise each day. Walk before work, during your lunch break, or whenever you can squeeze it in. Taking breaks to stretch your legs and walk can help prevent blood clots and sleep apnea too. Get a gym membership at a national gym chain and you can usually use your membership at any location in the U.S. As part of your route-planning routine, map out gym locations where you may be able to fit in a workout. Bring small exercise equipment like workout bands or small hand weights to keep in your truck to use when you have the time. Regular exercise is also helpful in building a strong core which will help prevent back and neck injuries. Avoid fast food as much as possible. More and more fast-ish food restaurants are popping up for people who are health conscious so unhealthy foods don’t have to be your choice on the road. They use fresh ingredients, lean meats, and have vegetarian options. An even better choice would be to pack meals, snacks, and drinks from home which allows you complete control over what and how much food you’re putting in your body. Regular checkups help you keep a close eye on your health and address any concerns with your doctor. When you’re behind the wheel, especially on sunny days, put on sunscreen to protect against sun damage. If you’re a smoker, quit. Your employer or insurance provider may pay for help for you to become smoke-free. There are better ways to prevent driver fatigue than taking stimulants. Getting regular sleep, having a healthy diet, and getting regular exercise will increase your stamina during long hauls. If you feel you have a dependency on stimulants or any other drug, see your doctor or call Narcotics Anonymous for help. Dogs are great companions during long hauls and many truckers occasionally bring along their spouse to keep them company. If you feel like you suffer from depression, see your doctor or therapist for help. Driving a truck doesn’t have to be an unhealthy profession. If you take the time to put your health and wellbeing first, you can maintain a healthy and balanced life. 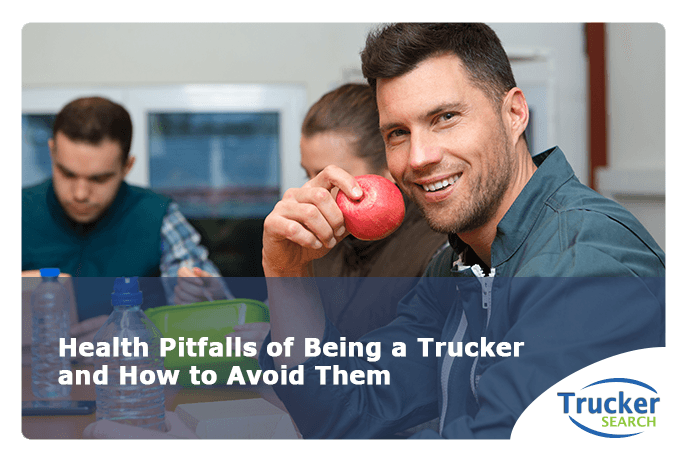 By eating better, exercising, and maintaining a healthy weight, you have a better chance at a long and successful career in the trucking industry. If you’re a seasoned trucker or new to the industry, Trucker Search can help you find just the job you’re looking for. Trucker Search is an online tool that helps truckers find great jobs all over the country and helps companies find you. Go to Trucker Search and start your search today! What is a HazMat Certification?